Overseas-based Macanese youth expressed their collective gratitude yesterday to the organizers of the third edition of the Macanese Community Youth Meeting on the last night of their trip to the city. “I am sure that the representatives of Macau who are living overseas will bring a little part of the city back home with them. Macau will always stay in their hearts and I believe they will keep promoting the city in their own countries,” addressed Duarte Alves to members of the Macanese diaspora at the closing ceremony held at the Macau Tower. 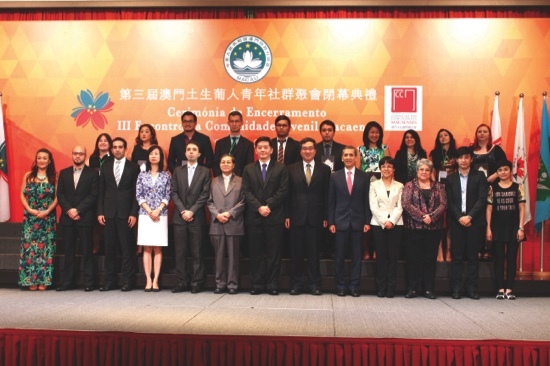 Afterwards, representatives from the Casas de Macau (Houses of Macau) around the globe shared their feelings about the seven-day event, in which they were exposed to the cultural side of the city. During the weekend, they experienced the excitement of the city’s annual dragon boat races and attended a Portuguese folk dance event. However, the stormy weather over the past few days spoiled the group’s opportunity to row dragon boats on the Nam Van Lake on Monday. Asked what impressed them most during their excursion to the mainland, Erin Ozorio from Toronto told the Times that she was struck by the significance of Chinese culture in the city.